Are you looking for that perfect gothic ring to add to your already growing collection of gothic jewelry? 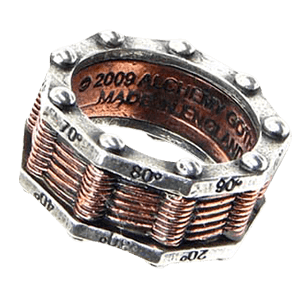 Well, you have come to the right place because we carry many types and styles of gothic rings. 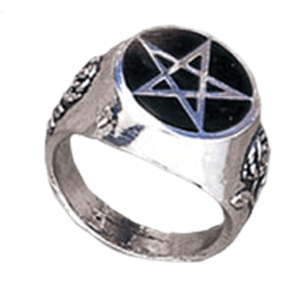 We have bat rings, pentagram rings, skull rings, skeleton rings, vampire rings, and more. Many of our gothic rings are made of fine English pewter and are made in Sheffield, England by master craftsmen, who are members of The Worshipful Company of Pewterers. One advantage of these pewter rings is that they do not need regular polishing to maintain their gorgeous appearances. Pewter jewelry does not tarnish like silver jewelry. Check out our entire selection of gothic rings to find the right accent for your unique look. All the other rings that do not fit into other categories are listed in this category. Many of these hand cast pewter rings have other high quality materials and finishes like crystals or brass and pewter on the same ring. These gothic rings would make a great addition to any gothic jewelry collection. We carry hundreds of styles of gothic rings that are hand made by master craftsmen in Sheffield, England. An advantage of this pewter gothic rings is that it does not need regular polishing to maintain its gorgeous appearance. We have many skull rings and skeleton rings with a gothic and medieval style to them. Many of these gothic rings are made in Sheffield, England, and are handcrafted of English pewter. 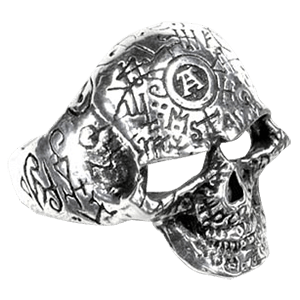 An advantage of these pewter skull rings, is that it does not need regular polishing to maintain its gorgeous appearance. Pewter jewelry does not tarnish like silver jewelry and to keep your gothic skull ring bright and shiny, an occasional cleaning with a quality proprietary metal polish will keep it looking brilliant. Our gothic skull rings in this section come in a variety of styles, including skull and crossbone rings, skeleton rings, skeleton hand rings, skull head rings, and fairy skeleton rings.